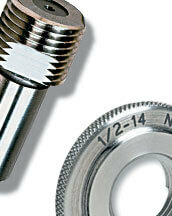 Thread Check, Inc. offers a complete range of standard and custom precision thread gages. 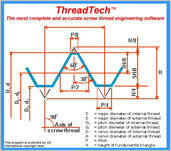 Software provides thread data on pitch diameters, major diameters, gage data & just about anything on threads. Test our Commitment to Quality, Service & Competitive Prices! Thread Check, Inc. is a full service gage company offering a complete line of precision thread plug and ring gages, plain cylindrical plug and ring gages, custom gauges, patented 3 wire thread measuring systems, API pipe gages, API master thread gages, tri roll thread comparators, powerful thread engineering software, gear measuring wires and instruments, cutting tools, master discs, ISO 17025 Registered calibration services, and free technical support. 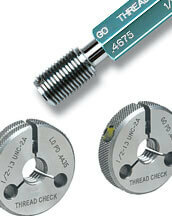 Thread Check, Inc. offers a complete line of AGD - American Gage Design, unified and metric thread gages. Thread Check Inc. manufactures thread gages to ANSI/ASME and many international standards including ISO, DIN, BS, and API gages. Thread Check, Inc. manufactures threaded and plain cylindrical plug gauges in chrome, tin coat, carbide, ceramic and other types of special materials. 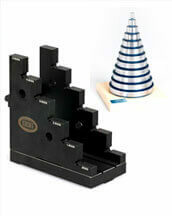 Thread Check manufactures many types of special gages including pre-plates, multiple starts, special leads, acme thread gages, API thread gages, buttress thread gages, spline gages, trapezoidal gages, flex hole location gages, British thread gauge, STI Helical Coil gages, square thread gages, extra length thread gages, and custom gauges to print. 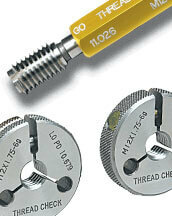 All Thread Check, Inc. gages are manufactured to the high end of the tolerance to ensure longer gauge life. All gages are traceable to the National Institute of Standards and Technology - NIST. Thread Check Inc.'s customer service team is led by expertly trained sales engineers and supported by some of the industry's most talented manufacturing engineers and gauging experts. Our engineering staff will assist in the design and manufacturing of special gaging products from concept to completion. 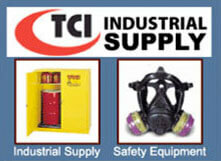 Thread Check Inc. offers express manufacturing and delivery services on many custom gauges at a premium charge. At Thread Check, Inc. we are committed to ensuring that every gauge we manufacture is of the utmost precision and quality. Please browse through our website to find the special gauge or thread gauge that suits your needs. 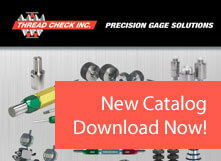 You may also download or request a copy of our comprehensive catalog, in which you'll find detailed information about each and every thread gauge, special or custom gauge, and gauge verification system. An air gage is an easy to use instrument that requires little or no training, and is designed to provide and accurate measurement of dimensions with very tight tolerances-typically 0.005 in. or smaller. 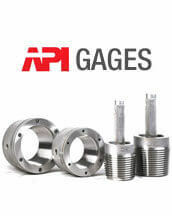 Air gages work simply by inserting the gage into a hole or over a shaft diameter. A reading is given almost instantly. Air gages are reliable and cost-effective, and are often utilized as the primary method for obtaining precise measurements.